Distilled strongly believes in content marketing, and that the time for content marketing is now. We've written recently about some specific types of content that brands can produce and publish, and I now want to share thoughts about the topics that you can cover on your blog or elsewhere on your website. It's important to think about when you'll be publishing specific content, as well as what you're publishing. Why Plan your Content Calendar? Creating content that is very relevant to your reader at that very moment has disproportionately high benefits. Being 'on-trend' or 'in touch with the zeitgeist' not only gives you some structure (relieving you from the "what should I write about next?" dilemma) but also increases the likelihood that people will interact with your content, that it will be shared, or that readers will take the next-step / CTA that you want them to. From Distilled's experience in creating content for our own sites, and planning content strategy for clients, we know that it's not enough to come up with your content ideas on a completely ad-hoc basis. The goal of reflecting what is currently relevant to your users should not suggest that publishing content based solely on what you've just realize will be interesting presently. When you see that Valentine's Day is a week away, you might be able to hunker down and get a blog post ready quickly. But you might not have enough time to produce more compelling content, such as an infographic or a video. Planning your content calendar in advance is a therefore a vital step in your content strategy. This means you must also understand the process and timescale for your organisation to create content of certain types, and allocate the resources of your team members. For example: if a designer can create a beautiful infographic in two weeks, then you might talk to them about a Valentine's day piece on Jan 31st—but if they're already scheduled to work on a new site design, then you could need to commission this from them as early as November or December. I'm not going to dwell too much on the 'How To' with you here, except to say that this will be a somewhat manual process that requires your expertise, knowledge of your niche and some time put into research. I've given a (pretty big) list of pointers below, but this really relies on you to schedule some time to work through all this. Depending on the size of your organization, you might want to work on most of this by yourself or you may want to collaborate with someone else for certain parts. Step 1/ Using the list below as prompts, try to make as exhaustive a list of 'events' as possible. 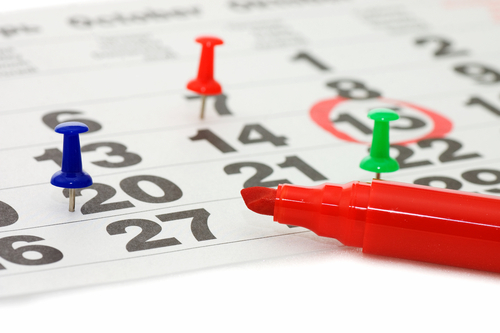 Step 2/ As you create the list, make sure that every event has a date associated with it. Step 3/ Order the list by date, and begin by focusing on the events occurring within the next ~ three months. Also pay particular attention to the 2 - 5 biggest events in your whole year. For a florist, this is Mother's Day and Valentine's. For Distilled, this is our events and recruitment drives. Step 4/ Figure out which events are most appropriate for you to target. Step 5/ At this stage, decide on the type of content you're going to produce for the chosen events. You can let your imagination run away at any stage of this process—content strategy encompasses much more than plain written content. Industry event coming up? You could live blog it. Your company is offering a new service? Write a whitepaper to generate leads in the month beforehand. Industry data going to be published? Have a template ready to create a data visualization of this. This list below is intended to be a place for you to begin your brainstorming. In each category I've given some examples—but these will barely scratch the surface. Note that my suggestions will be very UK/US centric (by nature of my experience)—the items might look very different in your country from my examples, but the categories should be pretty similar. It's also worth reiterating that this list is only to help you put together an editorial calendar around predictable events. If you want to create content around 'news' stories in your niche or industry (for example: "big algorithm changes" would be 'news' in the SEO industry) then you generally can't plan for when these will happen and what the story would be; this requires a very different type of planning, not covered by the predictable, scheduled events listed below.